All beginners of any domain are faced with the same issues. First "how do I get better at Salsa Dancing" or a variation on this question is "how do I improve my Salsa Dancing". I have wrestled with the question of becoming a good lead from the first day I started my basic step and I still ask myself this question every time I am getting dressed to go out dancing. I am not going to get into what is the definition of a good lead here but I can maybe tackle that question in a Blog later on. In this article I was thinking I wanted to write something that dancers could have as useful and practical landmarks along the salsa journey that steers them in the right direction. We only have limited time and energy to spend each day so it is important that we spend it the right way. I will list out the following main point that I think will allow you to traverse this tough journey for men. Let me say that many men never make it to the desire level of dance because is involve openness to criticism by others including women, it can be a humbling experience and you first have to accept that you know nothing and you are starting a journey. I admire all of the great dancers because it there is only one thing you know about a great dancer. They have remained passionate and relentless to make, the elements of musical timing, traffic cop, clear and firm but gentle leader all look so easy. 1. Dance more; Dancing is the only real practice for learning how to dance. Dance with everyone who will dance with you and have no shame. Do not fear rejection. Push through it. 4. Dance 50% social/ 50% classes. 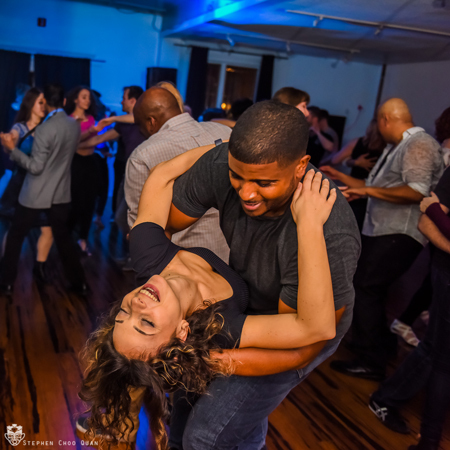 For each of your Dance classes you take, Dance one social party. This allows you to practice and master the many aspect your instructor was teaching. I personally would learn a turn pattern on Tuesday, Dance out on Wednesday then come back on Thursday to correct any issues I had while leading the move. Then you got all weekend to master the pattern. Enjoy it. 5. Keep Spinning. If you do not have a partner to work with, you can practice your spotting and spinning. Do a lesson with some spinning experts to learn more. 6. Make it a Friendly Game Joe, Jessica and I once held a competition on who can get the most social dances in a night. The catch was if we danced with someone that we danced with before it did not count. It did not matter who won that night but it was fun, get the most dances you can when you go out. 7. Dream and Imagine. You body can only go where the mind has already gone. Listen to more Salsa Music and as you do, think of how your dances will turn out, how you will lead while you execute your patterns. Do this so you can start to feel the music and associate your patterns to the music. This will make it feel more natural when you hit the floor. 8. Test Your Timing; When you are at class or in the car, see if you can find the 1 and 5 breaks or the 2 and 6 breaks in the music. See if you can anticipate the hard breaks. Test and retest this very often until you can find it without thinking. This will let you stay on time and create some magic moments on the floor. I recommend Stephen Tirpak’s https://www.deepinthesalsa.com/ there is nothing better. 9. Rest; Lastly I will tell you that you have to get some rest. On the 7th day the lord rested and you will need to set up a day of rest for you too otherwise you will burn out. I have a ton of more great tips and if you private message me, I would be happy to share my secrets. 3 Responses to "9 Tips to become better a Salsa Dancer - Improve your Salsa Dancing"
Very good article. I see point number 4 as the most important. Very good, thorough article. I wish to add an important tip... Always be polite and considerate of your partner, even if they are not a great dancer or a great looker. Look at your partner (and not at who is looking at YOU)... Smile and say thank you. This goes for men and women. In the end, I think you will find more people wanting to dance with you, and a better overall experience. Very good article, but I might add that you should stick to it and don't give up; it takes years for a non dancer to become a really good Salsa dancer and there is a huge amount of information to absorb. Don't bother stressing about getting instant results, just do as much as possible of the above and enjoy the journey..